I recently started training for a half marathon, and, as I increased my weekly mileage, I found that it was more and more important to properly fuel my runs. The day after a training run, I started to notice that my muscles didn't recover as quickly and my performance was more sluggish than in the past, so I began to focus more on good nutrition, especially after my workouts. I found that drinking a smoothie post-run has been essential to my recovery time. All of the nutritious ingredients that I include in them help fight inflammation and promote quick repair and healing inside my body, which is important for overcoming soreness and getting me out the door for my next workout. 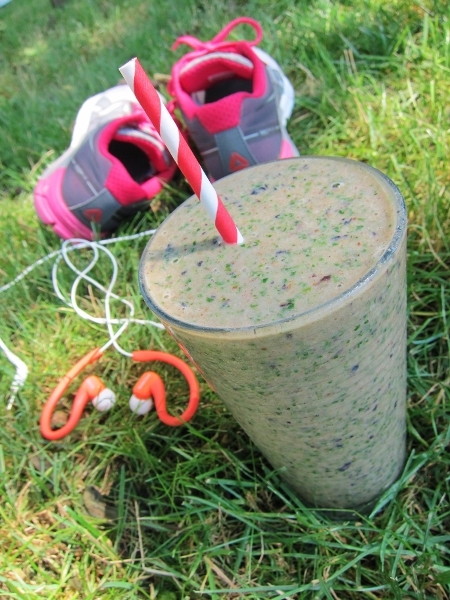 This smoothie recipe is one of my favorites for post-workout recovery. It includes a number of nutritional powerhouses that also have recovery benefits. Bananas, for instance, provide a healthy dose of potassium, which is essential for replenishing electrolytes which are lost through sweat. And, the best part about this smoothie, besides doing amazing things for your body, is that it tastes great too! Directions: Combine ingredients in a blender until smooth.